← What’s in the basket? I’m finally reunited with the two “lost” sewing machines trapped for too long in storage. I’m a sucker for a pink Atlas – my other one has been a favorite over the years, and this one still hasn’t gone for a test drive since the cord is cut. I found it on garbage day (or maybe the night before) on my old street. I can’t remember if I was late for work and trotting down the long hill to the bus, but found this and had to lug it back up and start all over again and ended up being really late, or I found it at the end of dusk slogging up the hill after a long day at work and it made my day. Either way, I schlepped this beast up a fairly substantial hill and haven’t gotten around to rewiring it for more than a decade. 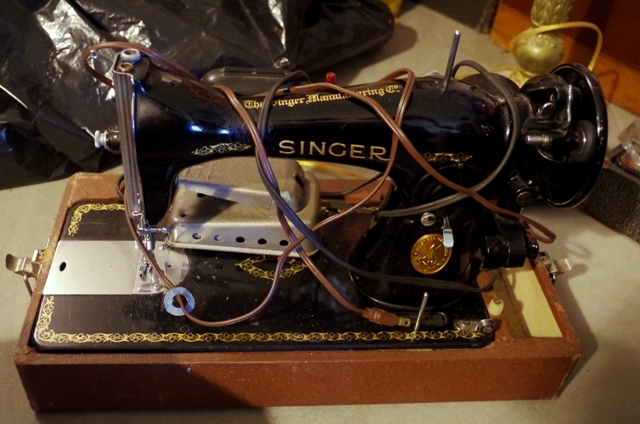 And this Singer hasn’t had much love – I’m pretty sure it’s a 66, and maybe I already had that 99 and got this thinking it was the same and I could use it for parts? All I know was it was an early thrift find and I don’t remember if it works now, and maybe I’ll part with it eventually. 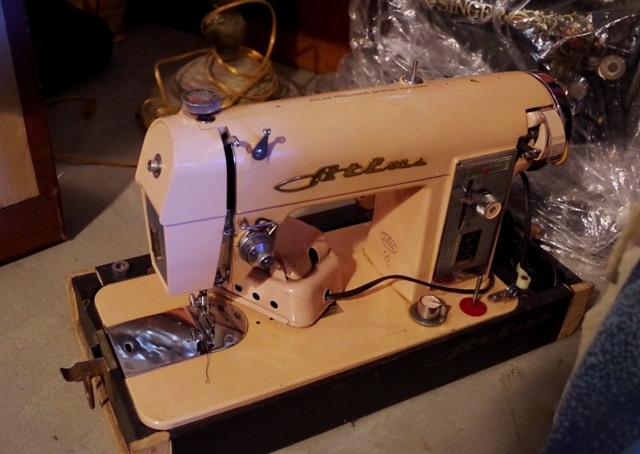 So I am done buying old sewing machines… unless I find one that has stitch functions I don’t have, is non-electrically operated (like a treadle in a lovely cabinet), or something that is uniquely and fantastically awesome – and all must be for a great price and reasonably sound condition. So, I’m really not in the market for them anymore unless I find something truly special. And that’s a problem. I wasn’t looking for a zig-zag machine a few weeks ago because I had been looking for the last 15 years or so and gave up – then, presto! This lovely beast followed me home. My current localish thrift is pretty decent – not a lot of vintage stuff, but good prices – I got this for $12.99. I’m also not sure if and how well it works yet, but the needle goes up and down which is the most crucial part. So as long as I can get this up and running, and if I ever get around putting a hand crank on one of my others, then I’m really not in the market for another, right? (Really, I’m not trying to jinx myself for the better, I don’t want more heavy old things). 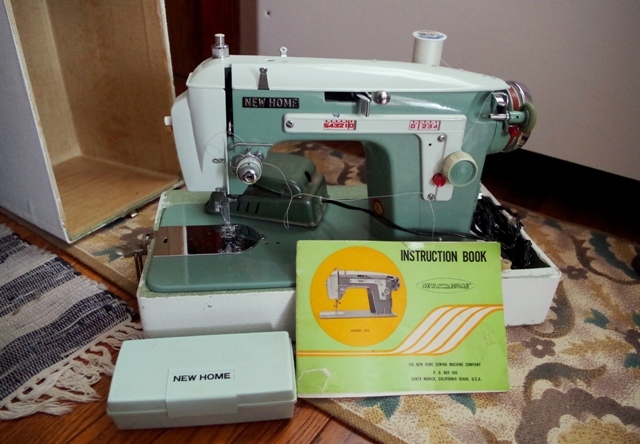 I’ve never owned a new, or less than 40-years-old, sewing machine but I’ve been wanting a serger for some time. I never felt I had a right (or the money) to buy one since I wanted it for making napkins and small bags and such, and those things can be made with any machine, just with folding and ironing added to the mix. But I wanted to take out folding and ironing, and in some cases, preserve as many millimeters of the fabric as I could, so I asked for and received this for my last “big” birthday – thank you mom & dad! I took it out for a test run a bit ago, and it’s going to be fun and quite useful, but like the others, it’s waiting patiently and safely until I get its room in shape, and more importantly, I find the damn bolts and wing nuts for the tables to put it on. 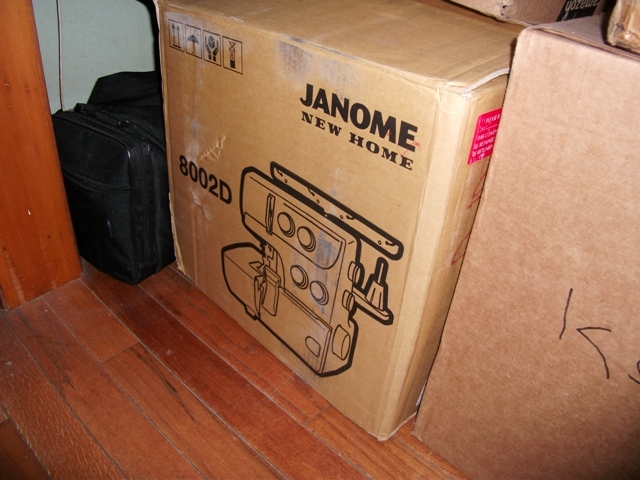 So it’s even more fitting that my last find was a New Home/Janome to go with my new serger – hopefully it will teach its younger sibling lessons in durability and perseverance. I have a 532 .that I bought in the late sixties when I was 18 or 19. I always wondered if the guy got a lot of them “somehow”. I have loved it dearly. A guy who supposedly cleaned it for me in a shop said it was just “tired”. 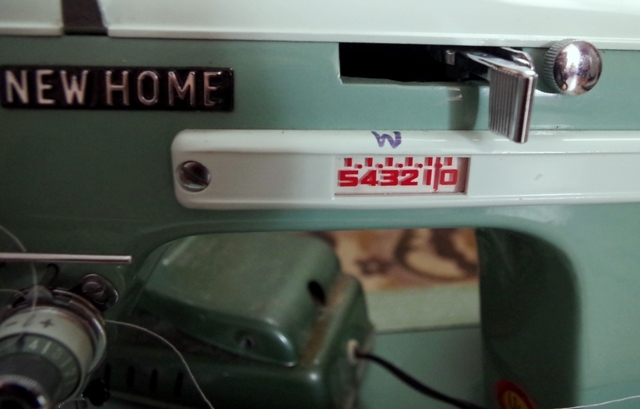 You can still buy the little janome moters for these machines. He wanted to sell me a new computer machine, I guessed. Now, a friend and I are going to be off looking for more old ones to buy. Can’t beat the old stuff.